Shakti is the concept or personification of divine feminine creative power, sometimes referred to as "The Great Divine Mother" in Hinduism. As a mother, she is known as "Adi Shakti" or "Adi Parashakti". On the earthly plane, Shakti most actively manifests herself through female embodiment and creativity/fertility, though it is also present in males in its potential, unmanifest form. Hindus believe that Shakti is both responsible for creation and the agent of all change. Shakti is cosmic existence as well as liberation, its most significant form being the Kundalini Shakti, a mysterious psychospiritual force. David Kinsley mentions the "shakti" of Lord Indra's as Sachi (Indrani), meaning power. 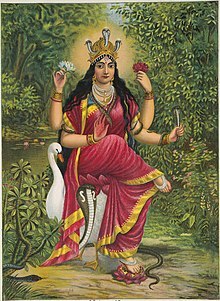 Indrani is part of a group of seven or eight mother goddesses called the Matrikas (Brahmani, Vaishnavi, Maheshvari, Indrani, Kumari, Varahi and Chamundi or Narasimhi), who are considered shaktis of major Hindu gods (Brahma, Vishnu, Shiva, Indra, Skanda, Varaha/Yama and Narasimha respectively). The Shakti goddess is also known as Amma (meaning 'mother') in south India, especially in the states of Karnataka, Tamil Nadu, Kerala, Telangana, and Andhra Pradesh. There are many temples devoted to various incarnations of the Shakti goddess in most of the villages in South India. The rural people believe that Shakti is the protector of the village, the punisher of evil people, the curer of diseases, and the one who gives welfare to the village. They celebrate Shakti Jataras with great interest once a year. Some examples of Shakti incarnations are Mahalakshmi, Kamakshi, Parvati, Lalita[disambiguation needed], Bhuvaneshwari, Durga, Meenakshi, Mariamman, Yellamma, Poleramma, and Perantalamma. One of the oldest representations of the goddess in India is in a triangular form. The Baghor stone, found in a Paleolithic context in the Son River valley and dating to 9,000–8,000 years BCE, is considered an early example of a yantra. Kenoyer, part of the team that excavated the stone, considered that it was highly probable that the stone is associated with Shakti. Shaktism regards Devi (lit., "the Goddess") as the Supreme Brahman itself with all other forms of divinity considered to be merely Her diverse manifestations. In the details of its philosophy and practice, Shaktism resembles Shaivism. However, Shaktas (Sanskrit: शक्त, Śakta, ), practitioners of Shaktism, focus most or all worship on Shakti, as the dynamic feminine aspect of the Supreme Divine. Shiva, the masculine aspect of divinity, is considered solely transcendent, and Shiva's worship is usually secondary. Adi Parashakti, whose material manifestation is Parvati and Tripura Sundari, is a Hindu concept of the Ultimate Shakti or Mahashakti, the ultimate power inherent in all Creation. This is especially prevalent in the Shakta denomination within Hinduism, which worships the Goddess Devi in all her manifestations. Her human or Shakti Svarūpa (powerful form), Parvati, was married to Shiva, while her Gyān Svarūpa (knowledge form), Saraswati, weds Brahma and her Dhan Svarūpa (wealth form), Lakshmi, becomes the consort of Vishnu. In the Smarta Advaita sect of Hinduism, Shakti is considered to be one of five equal personal forms of God in the panchadeva system advocated by Adi Shankara. ^ Insoll, Professor of African and Islamic Archaeology Timothy; Insoll, Timothy (11 September 2002). Archaeology and World Religion. Routledge. p. 36. ISBN 9781134597987. ^ Harper, Katherine Anne; Brown, Robert L. (1 February 2012). Roots of Tantra, The. SUNY Press. p. 39. ISBN 9780791488904. ^ Kenoyer, J. M.; Clark, J. D.; Pal, J. N.; Sharma, G. R. (1 July 1983). "An upper palaeolithic shrine in India?". Antiquity. 57 (220): 93. doi:10.1017/S0003598X00055253. ISSN 0003-598X. ^ Klostermaier, Klaus K. (1989). A Survey of Hinduism. NY, NY: State University of New York. pp. 261 (fn 1 p 473).